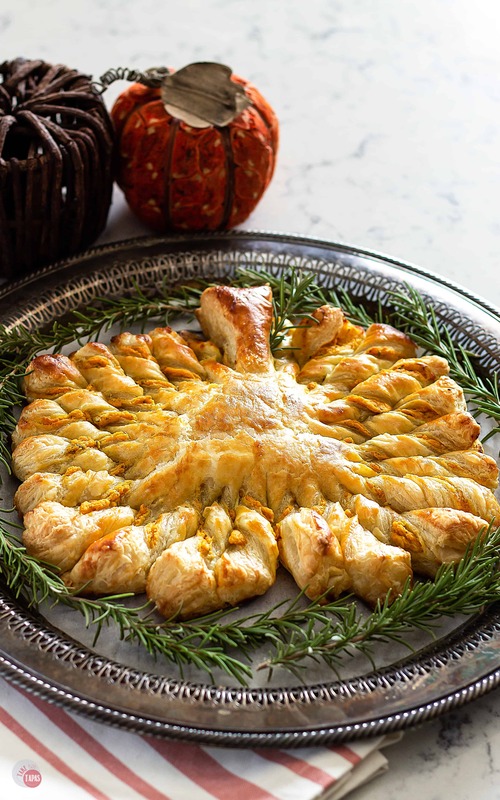 This flaky Pumpkin Pull Apart Puff Pastry is the perfect addition to your holiday party. Filled with roasted garlic, goat cheese, and PUMPKIN! Can we talk about the holidays yet? I mean I just saw the first bit of Halloween candy in the grocery store the other day and it’s still August! But even though I get mad they start bringing out holiday treats WAY TOO EARLY, I am getting excited about all the holiday parties. And all the yummy party foods that are there. It wouldn’t be the holidays without Puff Pastry! 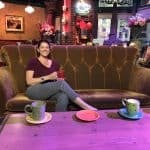 Is anyone else with me on this one? I always have about 8 packages of puff pastry in my freezer because I love to stock up when there is a sale. Just take me to the Pumpkin Pull Apart Puff Pastry Recipe Already! If you’d rather skip my (very helpful, I think) tips and tricks, essential cooking info, and similar recipe ideas – and get straight to this delicious easy Pumpkin Pull Apart Puff Pastry recipe – simply scroll to the bottom of the page where you can find the printable recipe card. What in the world is pull-apart puff pastry? Have you heard of Pull-Apart Bread? Imagine warm and toasty bread, layered with lots of gooey cheese and other yummy ingredients. You can just grab a piece or slice and it’s covered with a bit of those melty delicious toppings! Sound good? I think so too! What goes great with pumpkin? Inside this flaky and golden brown pastry is the perfect holiday flavor: PUMPKIN! I get excited when I start seeing pumpkins at the market. Even more excited than when I see those Pumpkin Spice Lattes at the coffee house because I don’t drink them. But what pairs well with pumpkin? Chocolate goes great with pumpkin. Check out my Chocolate Pumpkin Wontons and Chocolate Pumpkin Pudding Shooters! I think fresh rosemary goes well with pumpkin too! Also some tangy goat cheese. If I want to elevate it even more, I like to add some roasted garlic. Have you ever made roasted garlic? Super easy and it adds so much flavor! Roasting Garlic is easy and worth the time!! Just trim off the top half inch of a whole head of garlic, drizzle it with olive oil, wrap the whole thing in foil, and bake in the oven at 400F for about 30 minutes. 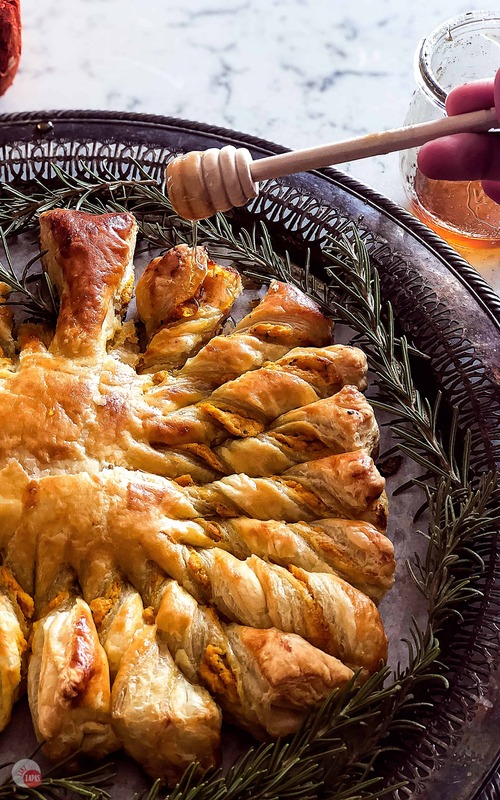 Once the garlic is roasted, you can just squeeze the garlic out of the cloves and spread it on bread, a burger, or add it to this amazing Pumpkin Pull Apart Puff Pastry! You can store the roasted garlic head in the fridge for up to a week. If I am going to keep it for longer, I squeeze it all out of the skins and then store it in a bag in the freezer. 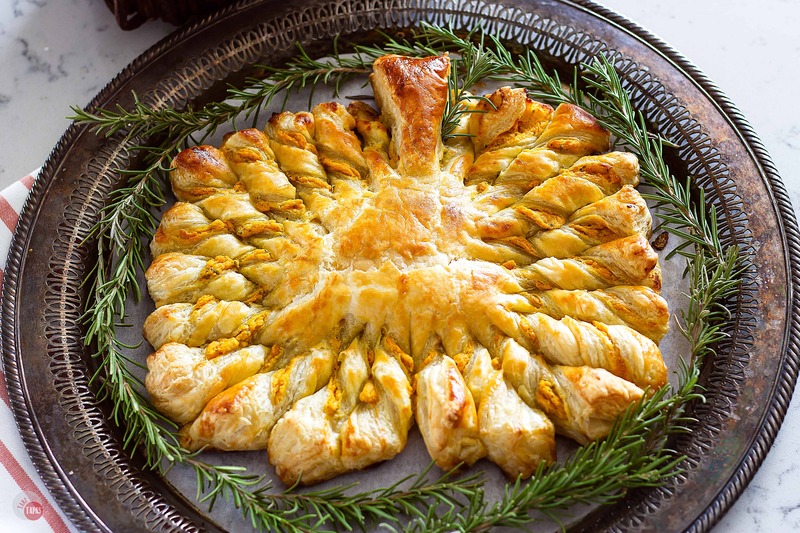 This Pumpkin Pull Apart Puff Pastry may look labor-intensive but it is absolutely not! 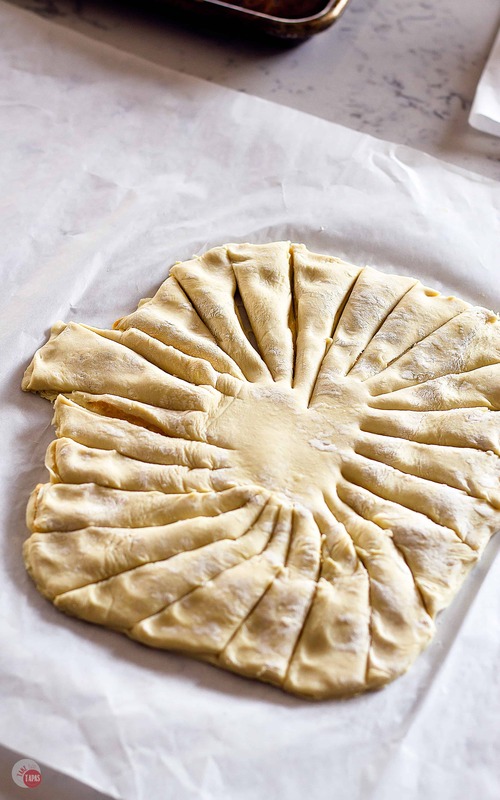 The puff pastry is easy because I love to buy it already made and skip the mess. Spread a quick mixture in between the two pastry sheets, slice into sections, give them a quick twist, brush with egg wash, and then bake! You can essentially make this into any shape that you want and add any filling that you like! Start thinking of all the possible shapes and flavors you can try! 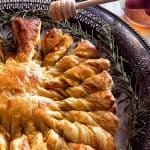 There are plenty of holiday parties that need a puff pastry pull-apart bread! Q: Why do you put an egg wash on Puff Pastry? A: The eggs help to make the pastry golden brown and shiny when it bakes. It is also used to hold together edges like in a turnover and helps toppings like salt and sugar stick to the crust. Q: Why do you call it Pull-Apart Puff Pastry? A: It’s designed to be able to pull off the piece that you want without messing up the rest of the dish. Q: How is Puff Pastry made? A: By layering dough and butter and rolling it thin. It is then folded over and rolled again. Doing this multiple times makes lots of layers of dough and butter. I buy mine because I don’t have the patience to make it but here is a great recipe for homemade puff pastry! Q: Can I substitute something else for the Puff Pastry? 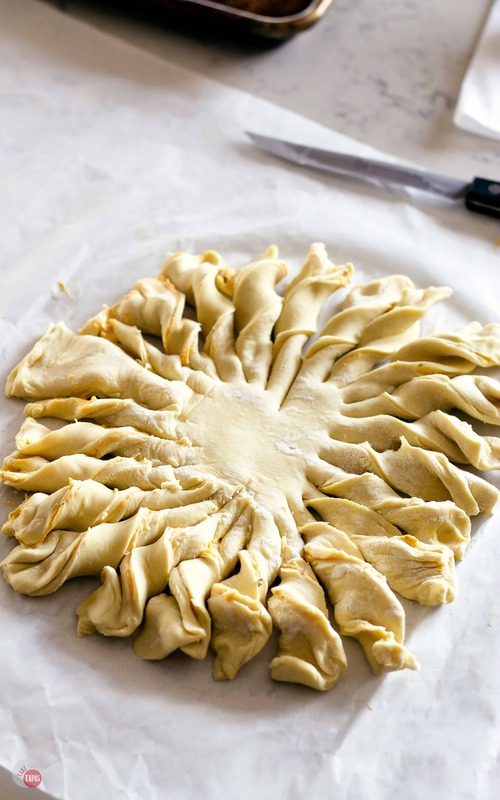 A: There is not an exact substitute for Puff Pastry because of it’s unique flavor and texture but for this recipe, you can use a pie crust recipe. Just be sure to roll it thin before using. Q: Is Puff Pastry gluten-free? A: The one I use (Pepperidge Farms) is not but you can make your own gluten-free. Here is a great recipe. 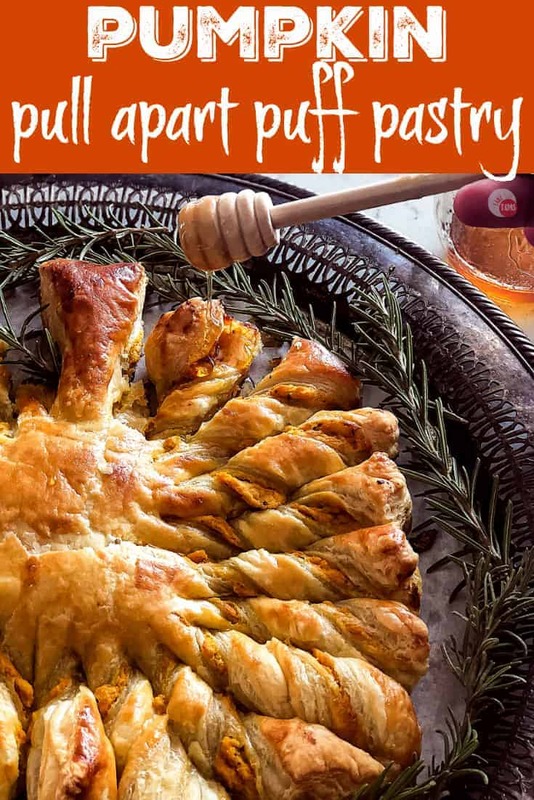 If you love this Pumpkin Pull Apart Puff Pastry recipe as much as I do, please write a five-star review in the comment section below (or on Pinterest with the “tried it” button – you can now add pictures into reviews, too! ), and be sure to help me share on facebook! On a lightly floured surface roll out one sheet to thin it a little. Place this on a parchment-lined baking sheet. Spread the pumpkin goat cheese mixture in the middle leaving a 1-inch border. Roll out the other sheet and cover the first one. Cut the layered pumpkin puff pastry in the shape of a pumpkin. Starting about 2 inches from the middle, cut the pastry out to the edges. 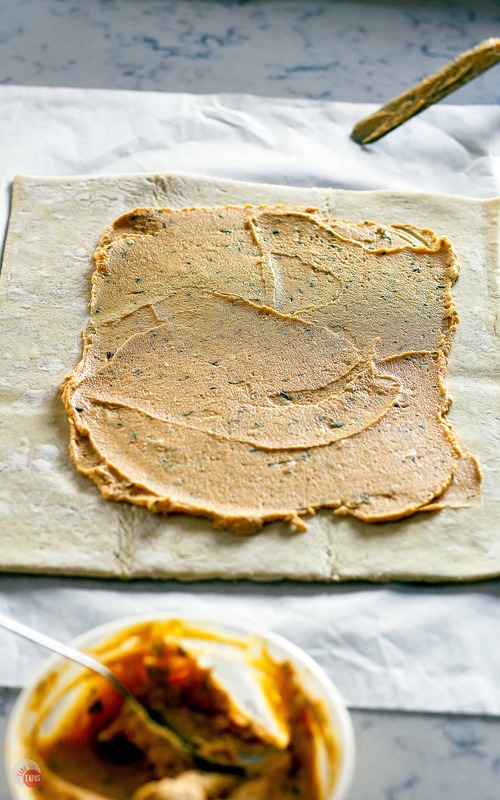 Continue around the pumpkin puff pastry until the whole thing is cut. With each section, twist it a few times. Once all the sections are twisted, brush the entire pumpkin puff pastry with the beaten egg/water mixture. Bake at 400F for 20 minutes or until golden brown and puffy. 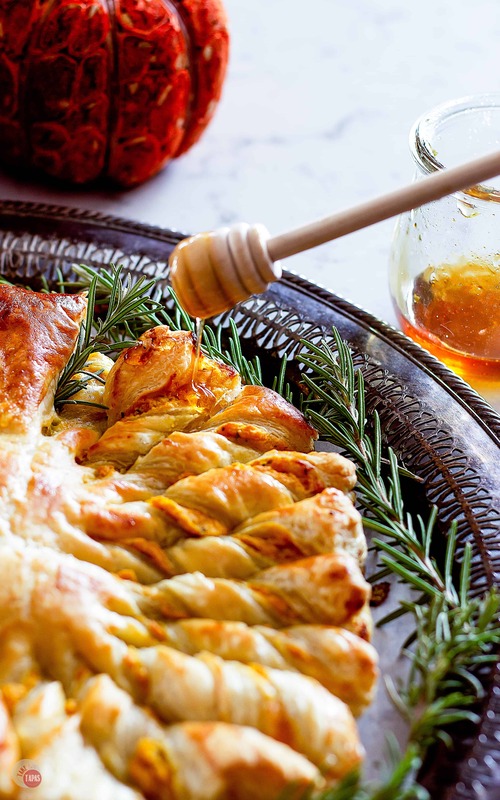 Drizzle with honey or serve it on the side. « Spicy Jalapeño Mojito – Easy, Refreshing, Sparkling, and Spicy! What quantity of goat cheese should be used? Goat cheese is not listed on the ingredients. I am so sorry! It’s 5 ounces of goat cheese or the small package. I have corrected the recipe card. Thank you so much for letting me know!